It’s mid-August in 2013, and we are working in the dry heat of the Jordanian Harra basalt desert. It is the last week of our second season of excavations at the 14,500-year-old archaeological site called Shubayqa 1. We have just finished exposing the stone floor of a Paleolithic house, and we are elated—it took six weeks of digging to get to this point. Our next target is to reach a circular, stone-lined fireplace, measuring about a meter across, that is set into the floor of the building. Careful excavation over the course of the next two days produces excitement among the team members: We have unearthed tens of thousands of charred plant remains preserved in the ashy sediment. This is an unprecedented find because plant remains from this timeframe in southwest Asia are exceptionally rare. And to uncover thousands in one spot is an archaeobotanist’s dream. Little did we know that further analysis would reveal something even more shocking: We had happened upon the earliest known crumbs of bread. Bread is the most common staple food in most parts of the world, apart from some areas of Asia where rice is king. It is also one of the most diverse food products: Each region makes its own distinct varieties using doughs made from water mixed with wheat, rye, corn, or other common plant-derived ingredients. Bread also has significant cultural, even national, connotations: What would France be without its baguette and croissant? Denmark without its rugbrød (rye bread) and smørrebrød (open-faced sandwiches)? The Arab world without pita? Every culture has developed its own types of bread that have, in many cases, become a culinary expression of identity. Baguettes, rye breads, tortillas, bagels, pitas, chapatis, focaccia, malooga (a flatbread found in Yemen), or nan—if you live in Europe, the Americas, Africa, or most parts of Asia, there’s a good chance that you’ll eat bread on any given day. Yet the origins of bread, and why and how it became such a popular and versatile staple food, have been shrouded in something of a mystery. Although labor intensive, making simple bread is relatively straightforward: One only needs water, flour, and a suitable place to bake—something as simple as a hot, flat stone will work. Archaeologists have detected traces of starch on grinding tools dating to the Upper Paleolithic (11,500–50,000 years ago) at a number of archaeological sites in modern-day Russia, Italy, the Czech Republic, and Israel. Although some archaeologists think this means that humans started producing flour quite early on, these tools could have been used to squash or pound starchy plants for other reasons, such as to make gruel or porridge. Grinding tools are also quite rare in the Upper Paleolithic, so even if these tools were used only for making flour, it doesn’t appear to have been a very common activity. Most archaeologists put the beginning of bread making in the Neolithic era, which first began around 11,500 years ago in southwest Asia. In the Fertile Crescent—an arch-shaped region stretching from the Nile Valley through the Levant into Anatolia and Mesopotamia—charred plant remains excavated from archaeological sites, along with abundant grinding tools, flint sickles blades, and storage facilities, suggest that people had begun to cultivate wild wheat, rye, and barley, as well as legumes. But what they produced from these plants has also been long debated. Some archaeologists assume it was bread, but other suggestions include porridge or beer. Conclusive evidence has been hard to come by—until now. Stretching from the Jebel Druze in southern Syria through eastern Jordan and into Saudi Arabia, the Black Desert got its name from its extensive black basalt boulder fields, which are only occasionally interrupted by a Qa’ (Arabic for a playa or mudflat) and wadis (a seasonal river). Archaeologists had long assumed that this semi-arid region played only a peripheral role in history. As a result, few scholars had looked at this area in any detail. One exception is the Australian archaeologist Alison Betts, whose pioneering search for archaeological sites in this area turned up a number of settlements dating to the so-called Natufian period. The Natufian, dated to 11,700–15,000 years ago, is often described as an important cultural precursor to the Neolithic era. During the Natufian, the world’s earliest stone houses, grinding tools, and sickle blades appear in large numbers in the Levant, suggesting that the hunter-gatherers here included plants, cereals amongst them, more frequently in their everyday diet. Natufian hunter-gatherers were also more sedentary than preceding Paleolithic societies, which may have pushed them onto a road of no return toward plant cultivation and agriculture. One of the sites that Betts excavated in the Black Desert in 1996 is the Natufian site Shubayqa 1, named after the nearby Qa’ Shubayqa. Although she briefly carried out excavations at this site, no further work was conducted at Shubayqa 1 until 2012, when our team from the University of Copenhagen launched a new series of excavations that continued until 2015. Our work revealed two impressively well-constructed circular buildings with cobbled stone floors dated to between 11,700 and 14,500 years ago—some of the earliest buildings known. This is where we found a surprising cache of more than 60,000 charred plant remains. This discovery in itself was extraordinary because, with the exception of Tell Abu Hureyra, a site situated on the Euphrates River in modern-day Syria, plant remains are so rare in this period—often just a handful or sometimes a few hundred. Analyzing ancient plant remains is a time-consuming, laborious process: To start, 10- or 20-liter samples of sediment have to be taken from different archaeological deposits and preferably dry-screened to pick out the most fragile remains. The remaining material is then run through a “flotation tank”—essentially a water-filled drum with a water pump and a series of meshes and fine screens. The previously screened sediment is loaded into a fine mesh affixed to the top of the drum. Water is then pumped up from the bottom of the barrel, dissolving the sediment. Light charred plant particles then float to the surface and are caught in a series of fine-meshed sieves at the top of the barrel. Once dried, the collected material must then be sorted under the microscope into different categories: wood charcoal, seeds, fruits, nuts, unidentifiable charred material, and dirt. Then the real work begins: the identification of the different species of plant materials, separating out, for example, wild from domestic types of barley. To do this, archaeobotanists use a reference collection—a library of known, charred seeds and other plant parts—against which the ancient material is compared using a standard microscope. We used the archaeobotanical reference collection at the Institute of Archaeology at the University College London (UCL) to help us with our identifications, since it is one of the best in the world. This, as it turned out, was a fortuitous decision. When Arranz-Otaegui told her that it was from a 14,500-year-old hunter-gatherer site in Jordan, it was Carretero’s turn to be stunned. The site was thousands of years older than Çatalhöyük. Together with Carretero’s supervisor, Dorian Fuller, we then set out to confirm this initial suspicion, using the methodology Carretero had developed for Çatalhöyük. 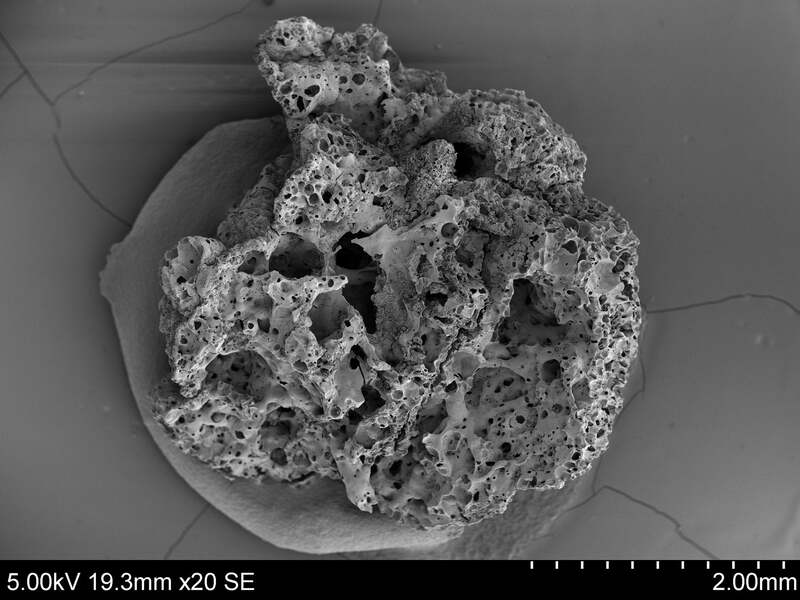 Over the course of two weeks, Carretero took hundreds of images with the SEM to compare the Shubayqa 1 samples with reference samples, and she confirmed that the charred particles from Shubayqa 1 were in fact tiny pieces of bread. To be sure, we then invited another specialist, Monica Nicolaides Ramsey at the University of Cambridge, to try and extract starch from the particles we had found. She found starch, confirming our finds. What does this mean for our understanding of the processes that led to the appearance of agricultural economies in southwest Asia about 10,000 years ago? The transition from the hunting and gathering lifestyle of the Paleolithic to the agricultural economies of the Neolithic has long been seen as a fundamental step in world history. Archaeologists have debated when, where, and why this transition occurred, but given the long timespans involved, details have been elusive. It can be argued that the transition from hunting and gathering to agriculture was, at its heart, not an economic or symbolic “revolution,” as has often been posited, but rather a food revolution—a matter of taste. What has been lacking so far is a better understanding of what people actually ate and how they obtained and made their food. With the discovery of bread at Shubayqa 1, we now know a little bit more about past foodways in southwest Asia. But this just leads us to ask new questions. Was bread already a staple food during the Natufian—or perhaps even earlier? Or was it a rare treat? Did people fall in love with bread, and did this spark their interest in producing more flour, perhaps incentivizing them to start cultivating plants? What were the effects of bread making and its consumption on Natufian and Neolithic societies? Thinking about what kind of foods people actually made in the past, how they obtained the necessary ingredients, and in what settings this food was consumed introduces a very human perspective on past food cultures. It is astonishing to think of the people who were able to make bread long before they had cultivated crops; bread is not the product of a “civilized society” but perhaps a precursor to it. So, next time you slide your toast into the toaster, pick up your croissant from the bakery, or dip nan into your curry, spare a thought for our Paleolithic forbearers who first came up with the idea of mixing flours of different plants together to come up with your daily bread.